Dinner parties, “girl’s night out,” and backyard BBQs are great activities for groups of friends but sometimes it’s nice to mix it up—how about a rafting trip? Here’s the beauty: nobody has to host or clean up, it’s adventurous and relaxing. Plus, it will bring your group together in new ways. Our expert advice and wide range of rivers make it easy to create an itinerary that will delight all your friends, whether they’re super athletic or more on the couch potato end of the spectrum! Booking at least 6 people on your river trip qualifies you for one of our group Discounts. If you have 24 or more friends rafting, you can save big money on your own private trip with our Private Charter Trip option available on the South Fork and Middle Fork American. 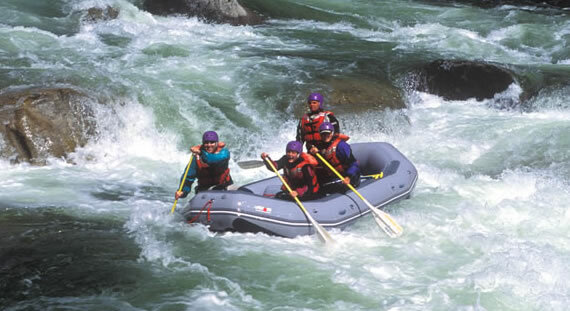 Start planning your rafting trip with our American River rafting page. The forks of the American River offer exciting rapids as well as calm sections where you can just relax and talk—or do a little water fighting! If you'd like to see all the California river rafting trips we offer, check out our California rivers map. Or, take a virtual tour of our rafting trips by browsing through our river video gallery.